The following Code of Conduct or Best Practice for Recreational Divers in Lembongan/Penida, Bali was established in consultation with leading sunfish experts, scientific researchers, experienced local marine managers, industry representatives and dive guides operating in the area for over 15 years. These guidelines are designed to provide a satisfying and safe diving experience while insuring the lowest sustainable impact on the sunfish population of Bali. These guidelines, while written for Bali, are applicable to any area where large numbers of divers are interacting with Mola mola at cleaning stations. The aim of developing the Code of Conduct for sunfish interactions is to ensure sunfish are able to settle onto cleaning stations without being disturbed. The removal of parasites at the cleaning stations is critical to the health of the molas. Once settled, the sunfish can remain on station for longer periods, offering better quality interactions for divers. We encourage wide dissemination of these guidelines by all such dive operations. Between October 2004 and August 2005 at Lembongan/Penida, overly aggressive divers routinely ousted sunfish from their cleaning stations. These interactions dramatically decreased the time sunfish spent nearshore and greatly limited the number of sightings provided to divers. Previous records, collected since the early 1990s (i.e. sunfish numbers, locations and behaviour) suggest that in previous years the “Bali sunfish” were present in much higher numbers. More importantly, the fish were more stationary and seemingly at ease at known cleaning stations—routinely the sunfish did not show any reaction to the divers’ observations and remained in their initial position for long periods. 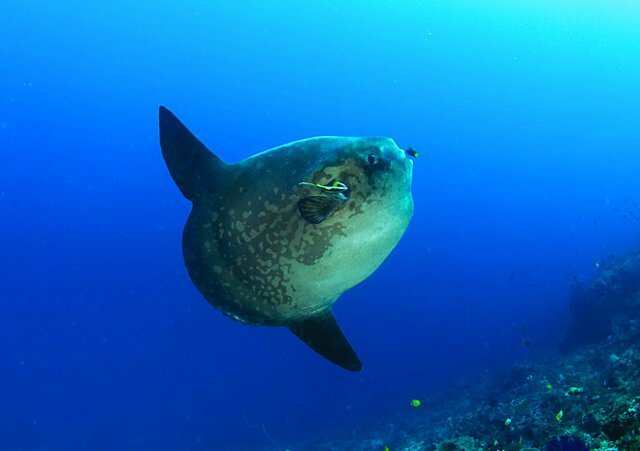 This allowed divers to enjoy the sunfish’s natural behaviour and more often than not an exceptional encounter with this mysterious giant fish. These encounters have given Bali its reputation as a world-class area for diving with the oceanic Mola mola. By voluntarily adopting this set of guidelines, it is hoped that local dive operators and divers can lessen the tourist pressures on sunfish and allow these fish to resume their natural cleaning station behavior and previous high numbers. 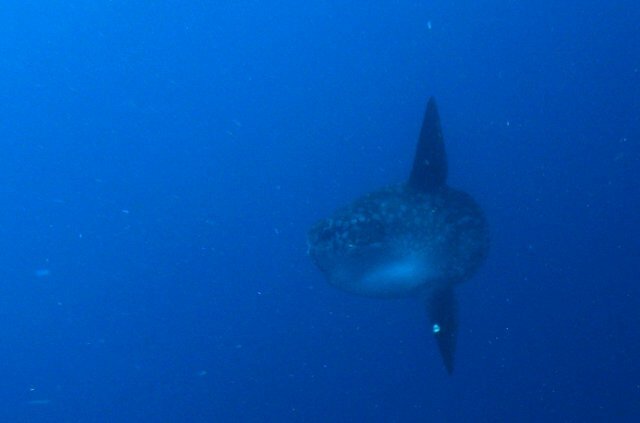 The quality of interaction, diver safety and hence the value and sustainability of this unique diver experience can also be maintained and ideally improved as the sunfish will be less likely to be frightened away. Contact us for a custom made dive package. That’s right, just tell us what you want and we will create it for you! With adherence to this voluntary Code of Conduct and Best Practices, the future divers of Lembongan/Penida can avoid the necessity for legislation and enforcement involving unwanted punitive fines. Always approach sunfish very slowly within its field of view. If the fish are just entering the cleaning station, do not approach until the cleaning has begun and the fish have been stationary for at least 1 minute. Maintain a minimum distance of 3m (or 2 body lengths) from the closest sunfish when animal is at a cleaning station. Maintain a minimum distance of 10m (or 5 body lengths) when animal is unsettled (not in cleaning) and considering approach to the reef. Do not swim behind the sunfish as this can startle the animal. Do not swim under the fish as your bubbles will disturb cleaning behavior. Wherever possible, do not block the sunfish’s escape route off the reef or pathway onto a cleaning station. If a sunfish approaches you, remain still and do not touch it. If you touch it you will remove the layer of mucus that protects it against infection. Do not use flash photography as this often disturbs the fish. Do not use personal underwater motorized propulsion vehicles or make unnecessary loud noises. Only dive with companies which have endorsed and adhere to the Code of Conduct. Follow the directions of your dive guide. What's next? 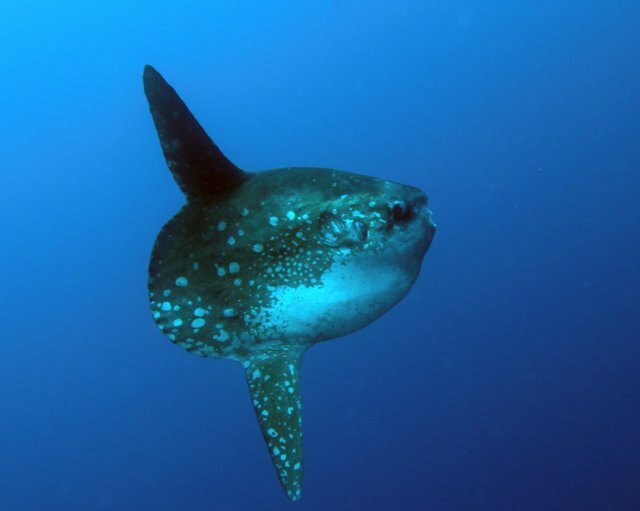 Check out the dive sites where the Bali Sunfish can be found!